Online Banking allows a variety of payment options to your loans, but for automatic payments to the mortgage must be established through the mortgage portal. 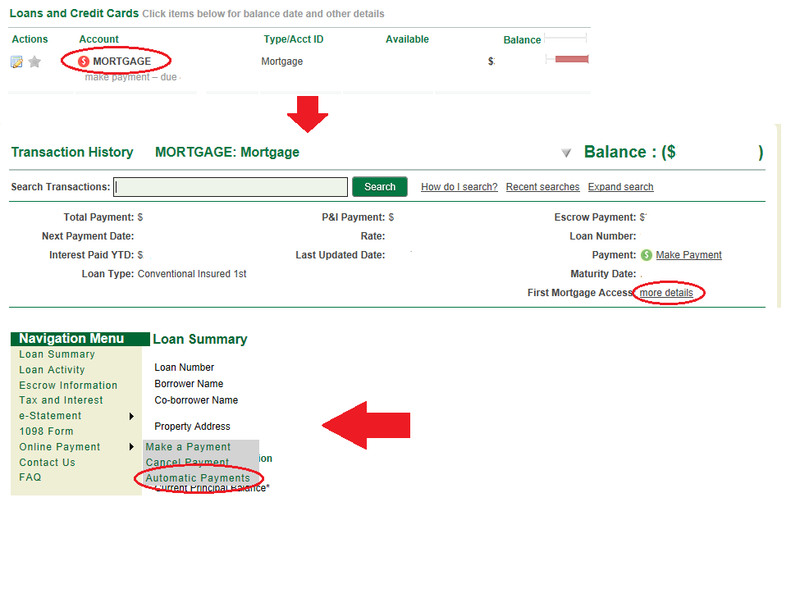 From the Account Summary screen select the mortgage, and then select First Mortgage Access more details. This will take you to the mortgage portal, and automatic payment, e-Statements, and tax information can be located. Under the Online Payment options, please select Automatic Payments from the list. If you select the mortgage portal and you get a message about your session being expired, it means that the internet browser you are using is not set up to allow for 3rd party or session cookies. Since we embed another website into our Online Banking, that particular cookie must be accepted. Please click HERE to learn how to adjust your cookie settings. When I look at my online banking I do not see some of my shares or loans, why?